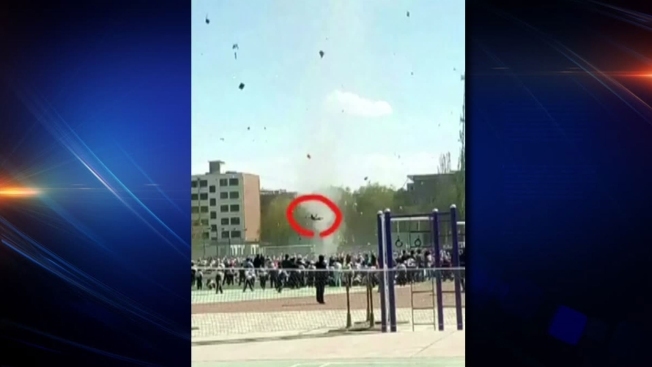 A boy was caught up and thrown through the air by a dust devil in China, and it was caught on video. It happened Wednesday during a sports event in Guazhou County in northwest China. The dust devil formed three times in the middle of a group of students. A teacher said they tried to evacuate students after the first dust devil hit. But they didn't get away fast enough. The second whirlwind was faster and bigger than the first, throwing clothes, books and schoolbag through the air. Then as students were told to lie on the ground, the dust devil sent the boy flying. His ordeal was brief - just a couple of seconds. The boy was taken to a hospital, where he is being treated for minor head injuries.